Cast: Chris Pratt, Zoe Saldana, Dave Bautista, Vin Diesel, Bradley Cooper, Michael Rooker, Kurt Russell…Sylvester Stallone? Well I feel both sorry and a little validated to report that on the topic of guardians who are of a said galaxy, I told you so. These films are bloated, overrated, and in the case of the second volume, boring. Guardians of the Galaxy Vol. 2, opens with our heroes banding together to protect the galaxy from some massive, disgusting, toothy intergalactic creature. It’s a battle. Peter Quill (Chris Pratt) strikes first and is quickly thwarted, Gamora (Zoe Saldana) is next, but her speed is no match. Rocket fires his blaster at will, but his blasts don’t penetrate the creature’s skin. Drax (Dave Bautista) determines, he will attack the creature from within and leaps down its throat. What follows is difficult to decipher. Not because of confusing filmmaking, but because the focus shifts to Baby Groot (Vin Diesel) dancing and narrowly avoiding blasts, shrapnel, and slimy tentacles whilst dancing to ELO’s “Mr. Blue Sky.” All of the fighting remains blurry background action. This is a funny, clever scene. This also marks the high-water mark of the film, and it’s downhill from here. Spoiler alert (not really), the mighty foe is vanquished, and the guardians bask in the glory of victory, accepting possession of Gamora’s sister, Nebula (Karen Killan) as reward from a group of golden skinned beings known as the Sovereign race. That is until Rocket pockets a few valuable batteries from the Sovereigns, causing them to pursue the guardians in an epic space chase culminating in the fortuitous arrival of Quill’s father, Ego (Kurt Russell). This sets the table for Volume 2 where Quill is forced to face and reconcile the deep-rooted feelings about his father’s seeming abandonment of him and his mother. There is much to discuss about Ego, but it would tread into spoiler territory, so I’ll simply say that Ego’s name is not misplaced. As I mentioned in the opening of this review, this film does not improve on its already humdrum predecessor. Like all the worst sequels, the filmmakers looked at what made the first film successful and just poured more of that on, with no regard for congruity. This time the soundtrack is no longer accompanying the film. In the first film, the soundtrack was a device to set a tone for the film. This time, it’s forcefully shoved into our face and ears to the point that the damn songs are actually plot devices. In one scene, Kurt Russell takes the time to give us a Master class on the lyrics of Looking Glass’s “Brandy (You’re a Fine Girl).” Also, Gunn and company crowbar the romantic subplot in there in such a haphazard way, I almost thought it was an attempt at being Meta. Quill refers to the romantic tension between Gamora and himself as an “unspoken thing,” so I thought perhaps this self-reference to a “will they or won’t they?” thing might go somewhere interesting. Instead, it simply becomes demonstrative of the same thing that a Meta version would condemn. This is not satire. This is not irony. This is just soap opera scriptwriting. My only concern before seeing this movie was Baby Groot. I was worried about the problematic nature of this “cutesy”, silly, obvious merchandising stunt, but Baby Groot ended up being the strongest quality of the film in the same way that “Adult Groot” was the heart and strength of the first film. Additionally, as with all Marvel movies, Dr. Strange included, there are other elements of this film that do work. The world is expanded with this film to include some new characters including Mantis (Pom Klementieff), the aforementioned Ego, and a bazaar turn from Sylvester Stallone as Ravager leader Stakar Ogord. These characters are introduced and developed to various degrees in effective ways. Michael Rooker also returns as Yondu to positive effect, and I do get a kick out of Bautista’s dry, honest portrayal of Drax. Guardians of the Galaxy Vol. 2 is rated PG-13 and has a running time of 2 hours and 16 minutes. There are also several stinger scenes sprinkled throughout the credits and one after the credits as well. Out of the Furnace poses a rather critical conundrum. On one hand, the film’s gritty exploration of one man’s quest for justice is finely acted, but on the other hand, it is substantially conventional. 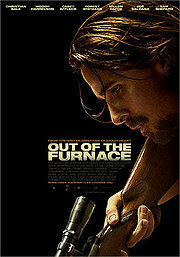 Director Scott Cooper follows up his enormously successful 2009 film Crazy Heart with Out of the Furnace. In it, steel mill worker Russell Baze (Christian Bale) works in order to take care of his terminally ill father while his Iraq-War veteran brother Rodney (Casey Affleck) tries to find a way to adapt to life back at home. On the surface, it is a film about fathers, sons, and brothers. However, Cooper opens his film with an alarmingly tense and violent scene at a drive-in movie theater that includes neither of the film’s two main characters. This scene sets the tone for the film as well as attempts to set the stage for its ambition. Unfortunately, Out of the Furnace can not quite maintain its balance between narrative and ambition. The ambition angle aims to document and test the two brothers as life locks them in a metaphorical “furnace.” Russell spends several years in prison for a drunk driving accident and Rodney begins a downward spiral after the war that leads him to an underground fight-ring headed up by a ruthless kingpin, DeGroat (Woody Harrelson, in his most frightening role in years). When Rodney suddenly disappears, Russell takes matters into his own hands and goes on a manhunt. This is when Out of the Furnace ends up stepping on the heels of a film released earlier this year, Prisoners. Both films want the audience in a “what would you do?” type of scenario, but Prisoners executes it much better. Both films even have a deer hunting motif! Out of the Furnace is clunky structurally and it is heavy handed in its treatment of flawed characters who “just want to do the right thing.” However, the film did attract big, big stars who all came to play. Affleck and Bale turn out career performances, and the supporting players include Willem DaFoe, Sam Shepard, Forest Whitaker, Zoe Saldana, and the aforementioned Harrelson who are all quite compelling as well. Out of the Furnace is rated R, and has a running time of one hour and 46 minutes. I say see Prisoners instead.